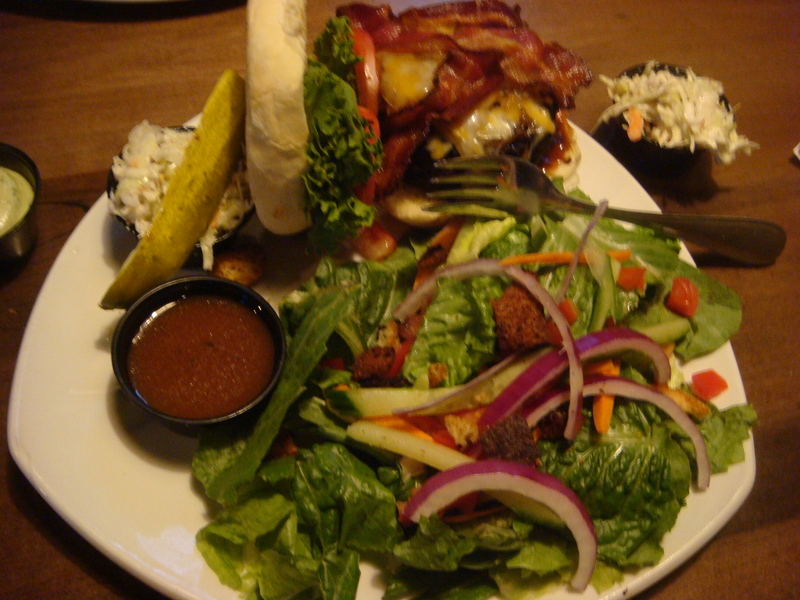 I seldom visit the Pickle Barrel restaurant, not because a lack of decent food or a dislike with the atmosphere but simply because it never springs as a go-to option when hunger strikes. I’ve gone a total of 3 or 4 times in the past, mostly to this exact location since it is the closest to my home. My sister had just gotten another acceptance letter from another university so our family decided to celebrate by going out for the night and getting some food. 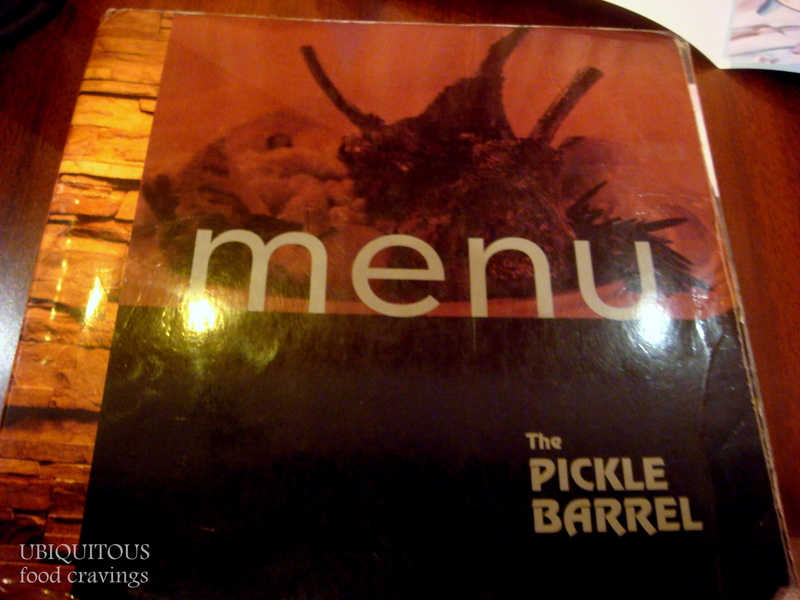 After much deliberation as to where we could get what my sister was craving, we decided to head down to Markville Shopping Centre and visit the Pickle Barrel for some dinner.It had been a long time since our last visit but we were excited. 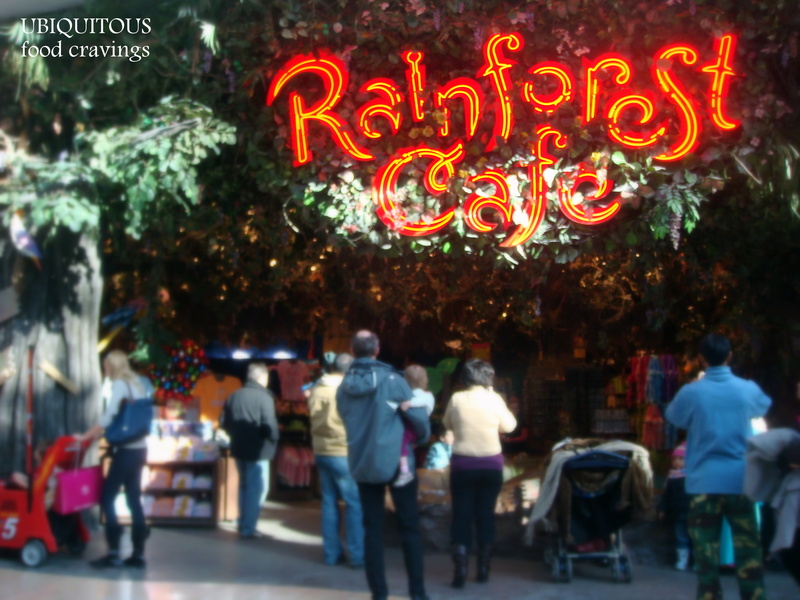 The Rainforest Cafe experience is highly kitschy, unique and appealing to the senses. 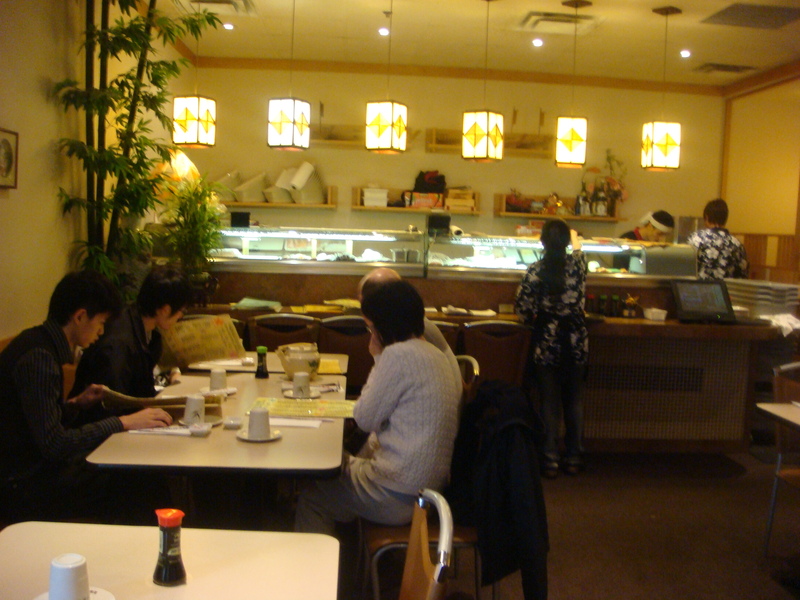 I remember when the restaurant used to have multiple locations in Toronto and my family often went when I was younger. I even attended a birthday party there which is an experience I’ll never forget. Unfortunately, the only two places left to experience it in Canada is either in the Niagara Falls area or at Yorkdale mall. On another shopping trip, my family decided to head over to Yorkdale mall which instinctively created a craving for both my sister and I to eat their famous dessert. 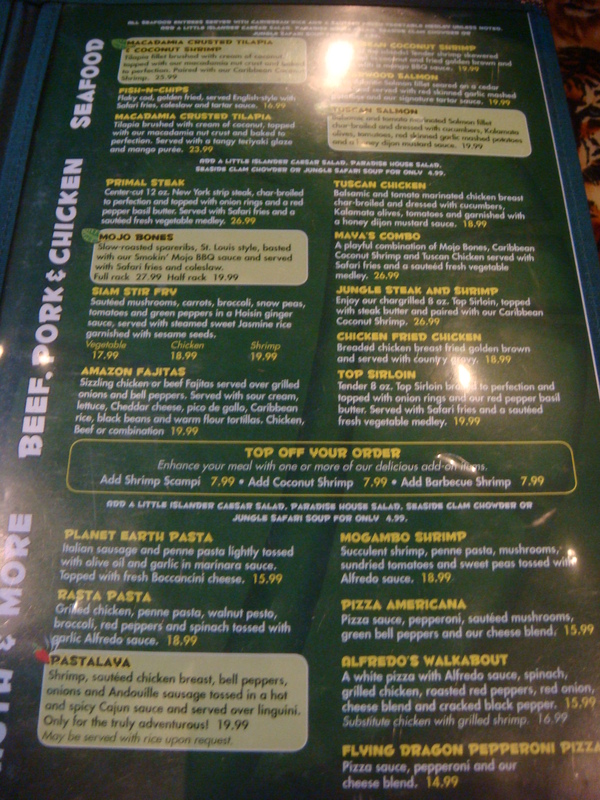 With most franchised restaurants, the menu doesn’t have highly unusual food but it remains fairly consistent and hits the spot when you’re hungry. Szechuan Szechuan is a pan Asian and Szechuan restaurant. 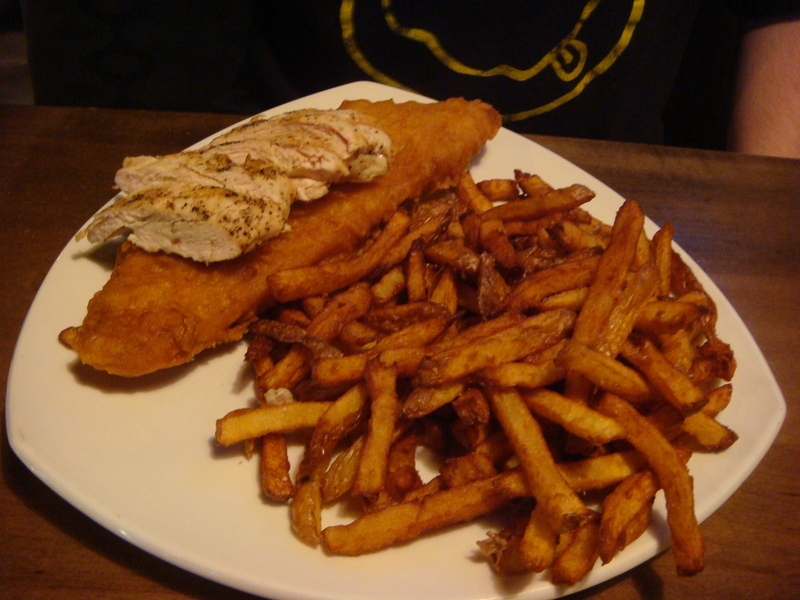 It has two current locations; one in Vaughan mills and the other in the First Canadian Place in downtown Toronto. 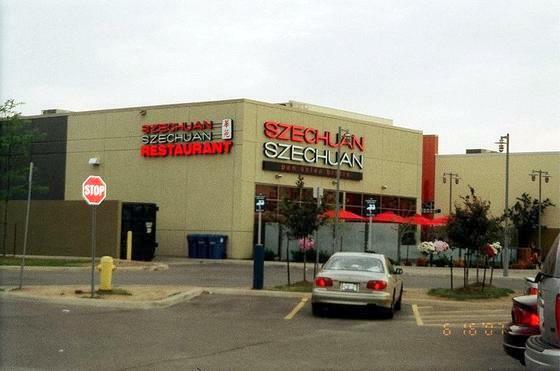 On a shopping excursion to Vaughan mills, my family decided to eat at the Szechuan Szechuan restaurant. We decided for quicker service and general convenience to stick with the takeout/express service as opposed to the sit down meal in the restaurant. I can’t comment too much on decor but it looks really classy and modern inside the restaurant. The website displays some pictures. 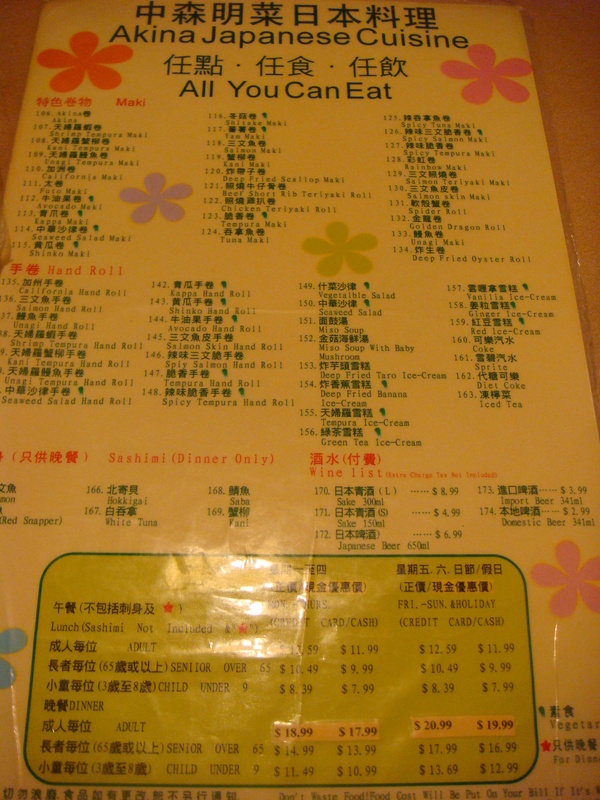 The food choices are quite extensive even for the take out. There are soups, salads, main dishes of every meat, sushi, side dishes, rice, noodles and set menus with the type of food ranging in the Chinese, Thai and Japanese flavours. Simply ideal if you ask me. We ordered 4 dishes, one for each of us and ended up with leftovers. 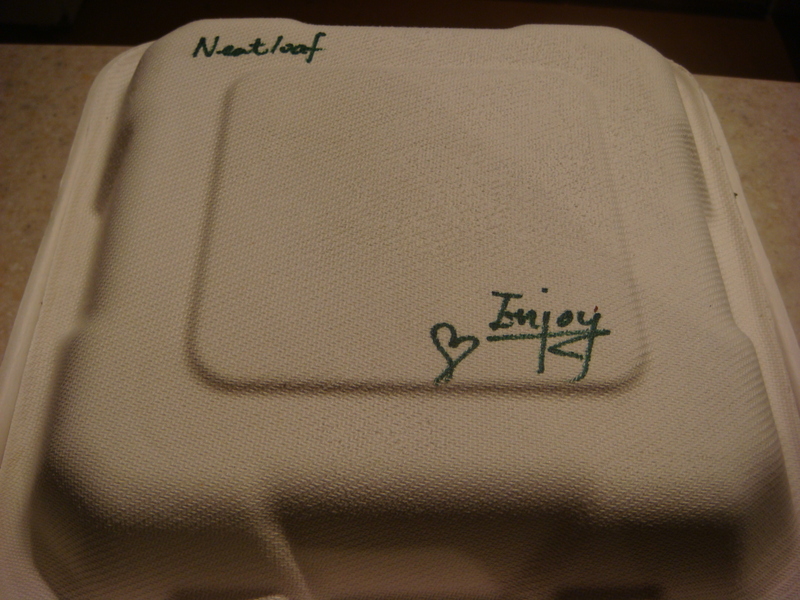 The other bonus to the take-out service is that they provide take out boxes of all sizes if you’re unable to finish. There’s also water on hand so you don’t have to worry about buying tons of drinks if all you need is some refreshing water to go along with the meal. The take out service has certain special up on the board with enticing photos as well as the menu. It’s all very clean-looking and appetizing. I can’t really explain the thought process behind choosing what we did that day. We all wanted a little something different. 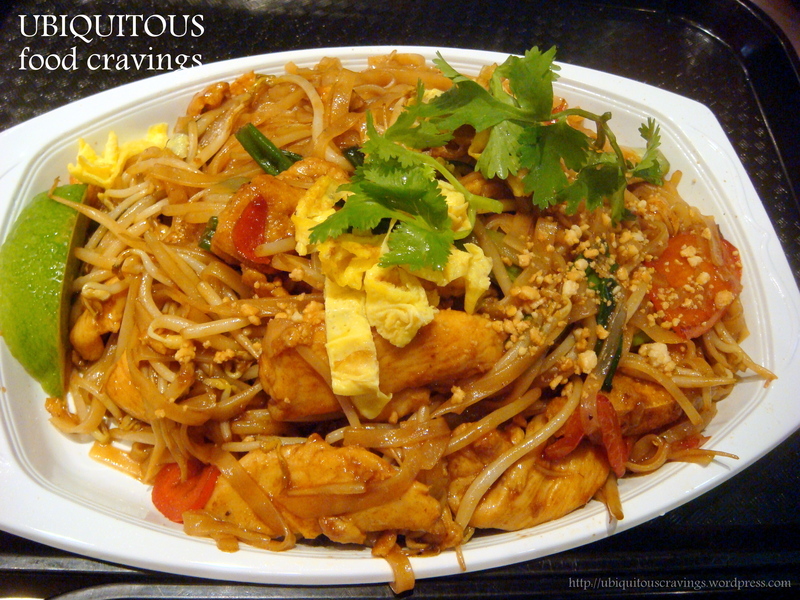 I remember choosing the Pad Thai ($9.95) simply because the other noodle choices didn’t seem appetizing at the time and although Pad Thai dishes in most places aren’t all that authentic, I’d settle for it over other options. It was surprisingly better than I had anticipated, certainly not super authentic but better than most. There was a lot of flavour and you could definitely tell that it was freshly made to order. I could happily live off of Pad Thai for the rest of my life. My father got the General Tso Chicken ($10.50) since it was advertised as a house speciality. I can’t say it looks all that appealing in this photo but it was definitely delicious. A little too much on the salty side so luckily we had some rice to go with it. There wasn’t as much spice and kick as you’d think there’d be considering all the dried peppers in the dish. I like my food spicy but I don’t mind either way. Definitely a hearty dish. I’m not 100% sure what this is. Upon reviewing the online menu, I tried to figure out what this might be and was torn between two choices. 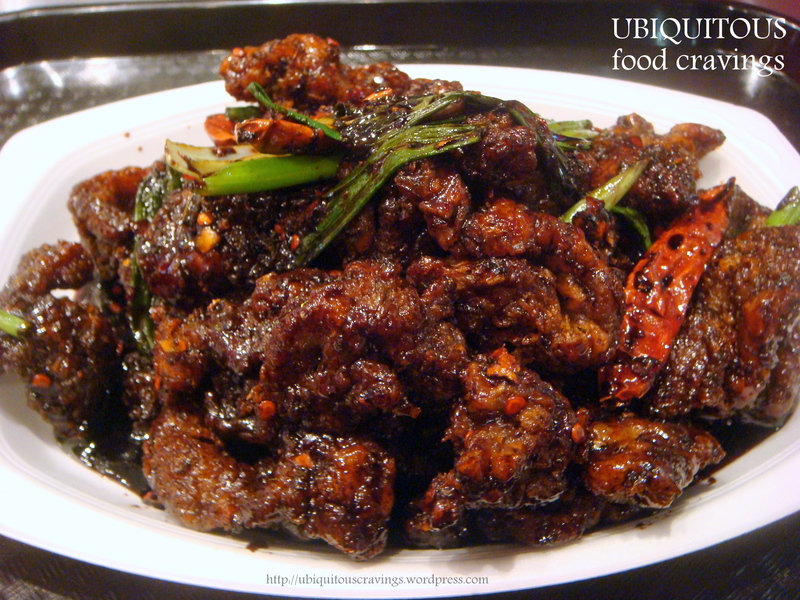 I’m leaning more towards Crispy Ginger beef ($10.95) but someone correct me if I’m wrong. 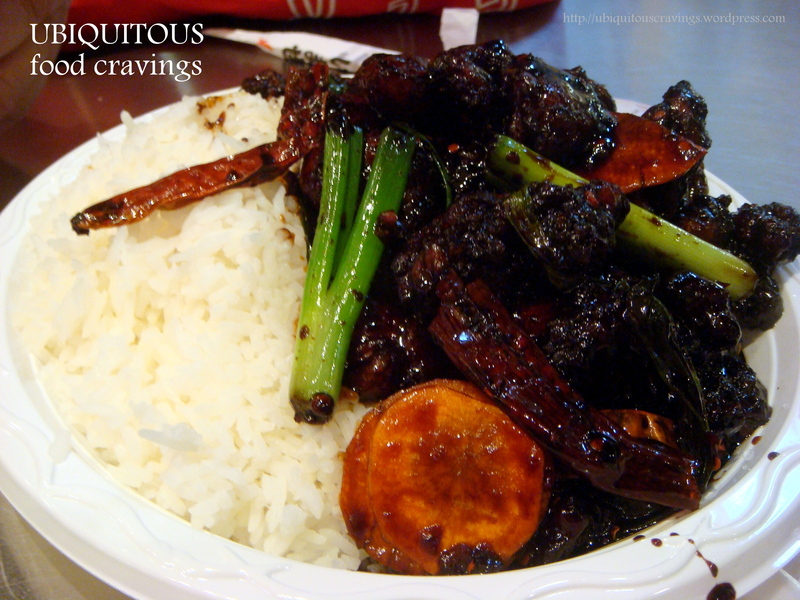 At my favourite Szechuan restaurant, they have a similar crispy beef dish so we decided to try this out. It was certainly tasty but a little salty as well. We might have ordered extra rice because of it. Again not as much spice and kick as you’d think considering you can see the big pieces of dried peppers. We had some of this left over in the end. 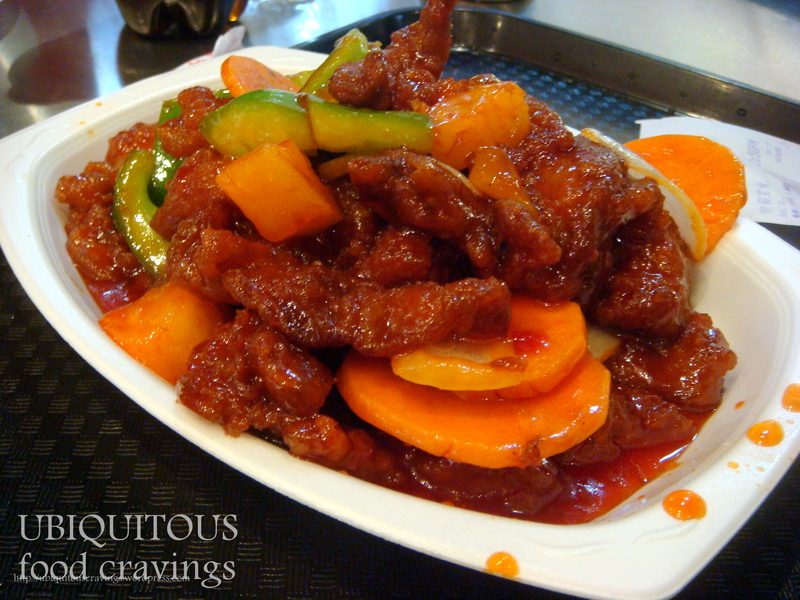 And finally, my sister decided she wanted Sweet & Sour Pork ($8.95), a Chinese classic dish. Also tasty but pretty generic compared to others you could find elsewhere. She happily gobbled it all up. I’ve noticed in the last little while that my home cooking strays more towards the vegetarian region and my restaurant/takeout meals lean more towards more meaty dishes. 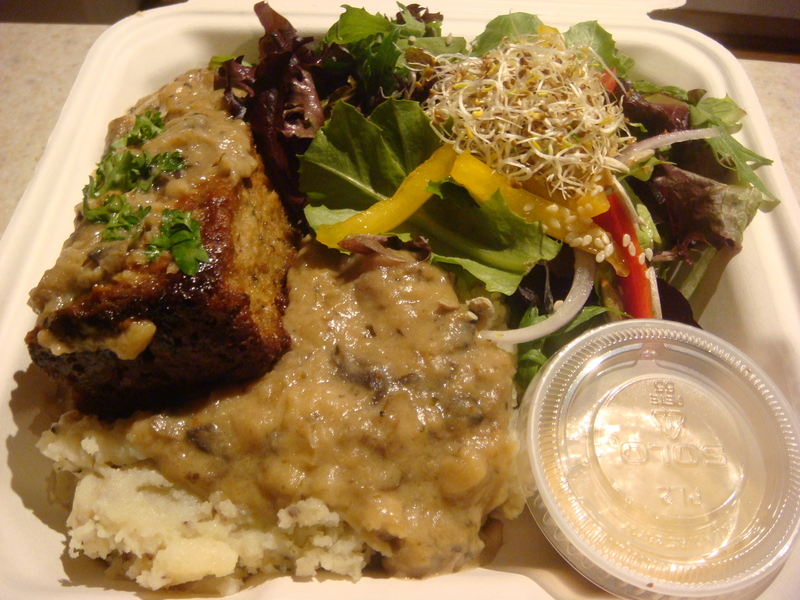 So I wanted to switch things up and try the vegetarian fare at Lotus Hearts Blossom. 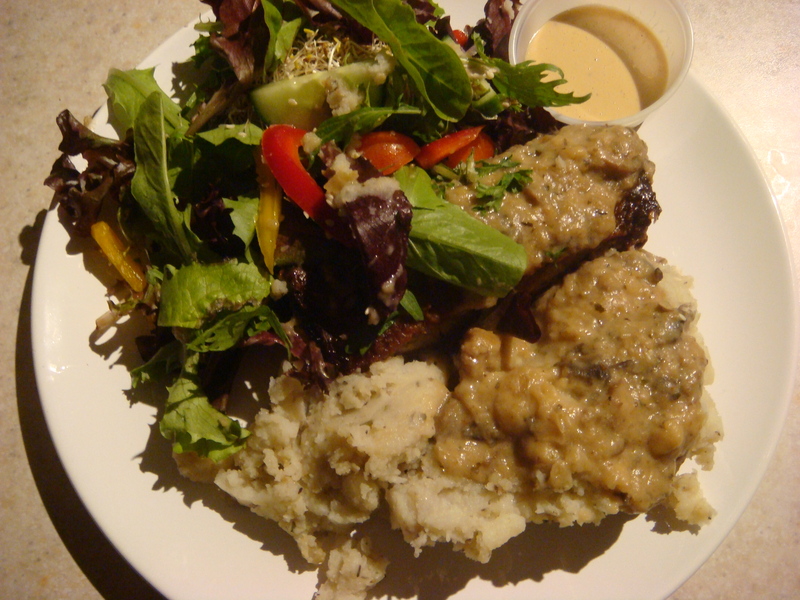 Since moving to downtown, I became aware of the lovely vegetarian restaurant close to where I live. I’m actually able to look into the restaurant from where I live and I often people watch from time to time while in my kitchen. I was thoroughly surprised at how much traffic the restaurant received. I looked over their great website and wonderful menu and I realized that I had to give the restaurant a try. I decided to do take out because I’m the type of person who feels a little uncomfortable being in a restaurant alone, especially one that I’ve never tried before. Take out was also more appropriate because at the time I was busy doing lots of readings and housework so I just didn’t want to bother with sitting in the restaurant. 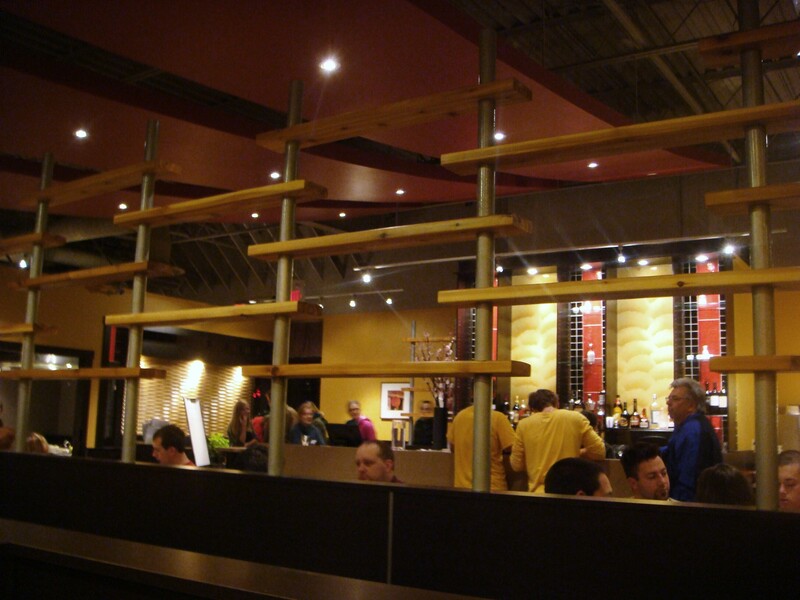 Their menu is quite diverse and features so many great dishes and drinks. They feature some vegan and gluten free items when they can. 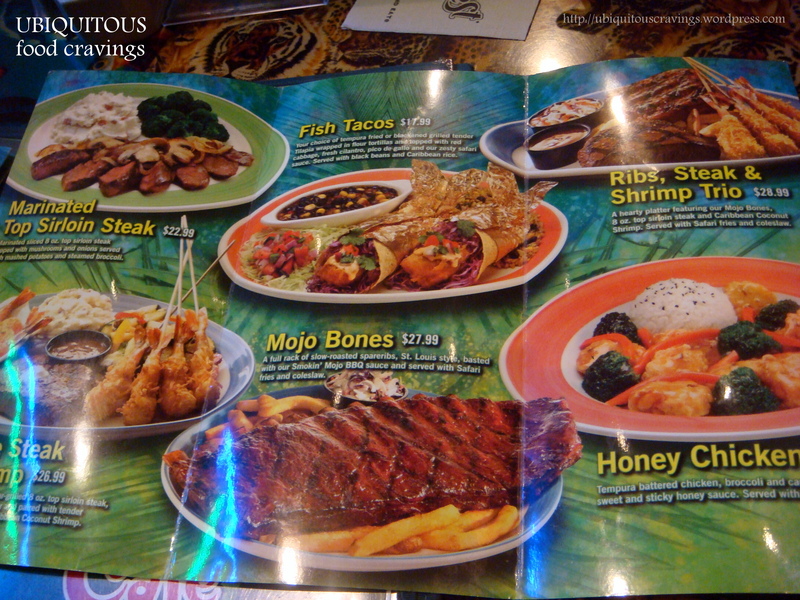 They’ve chosen dishes that have lots of spices and herbs to bring out the most flavour from their ingredients. 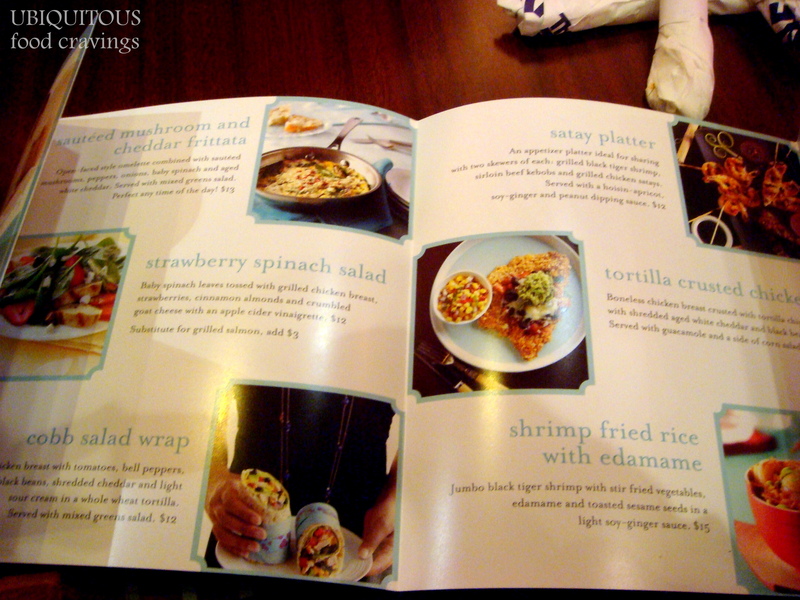 There are hints of indian, mexican and mediterranean to their meals. It was actually very difficult for me to decide since it all sounded so appetizing. 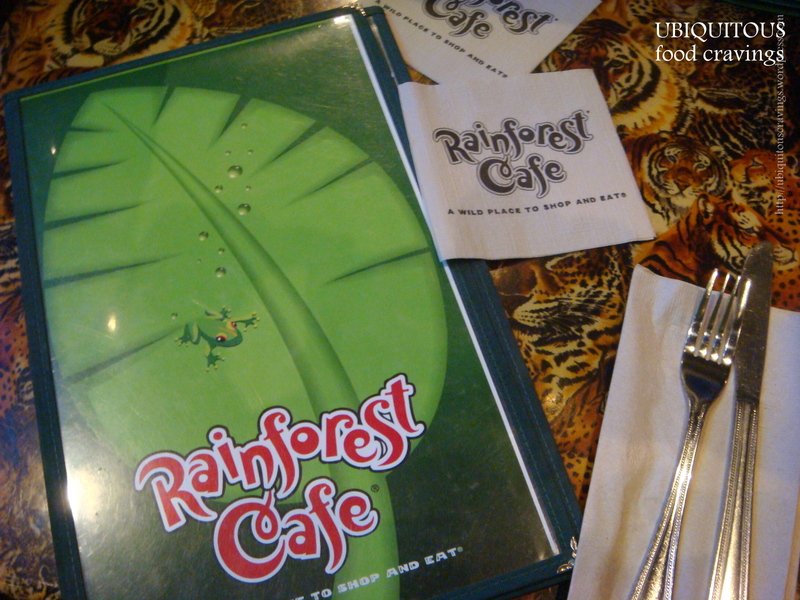 Their menu is separated by all day selections, lunch meals and dinner meals. They also have a brunch menu for the weekends. Check their site for hours. 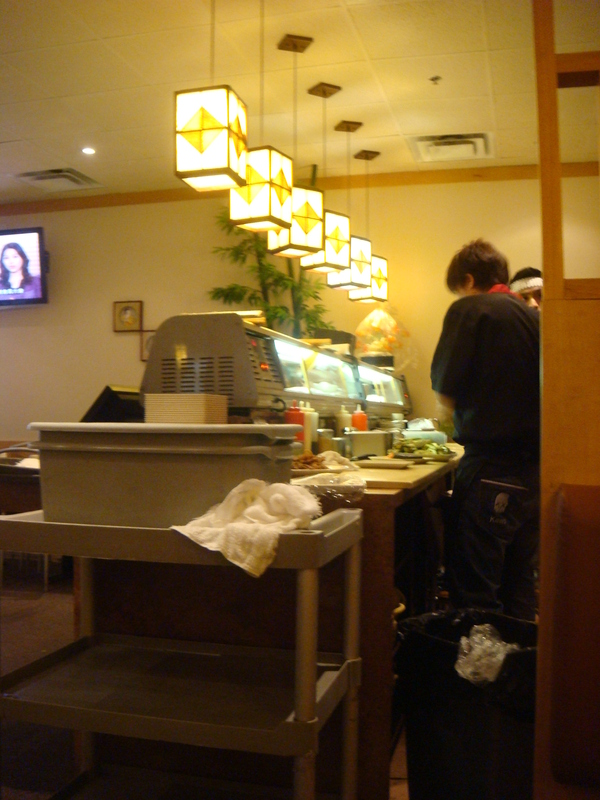 When I picked up my meal, I got the opportunity to see the interior of the restaurant myself. It’s an experience for sure. There wasn’t too many people in the restaurant when I went to pick up mainly because it was later in the afternoon so the place was rather quiet and calm. 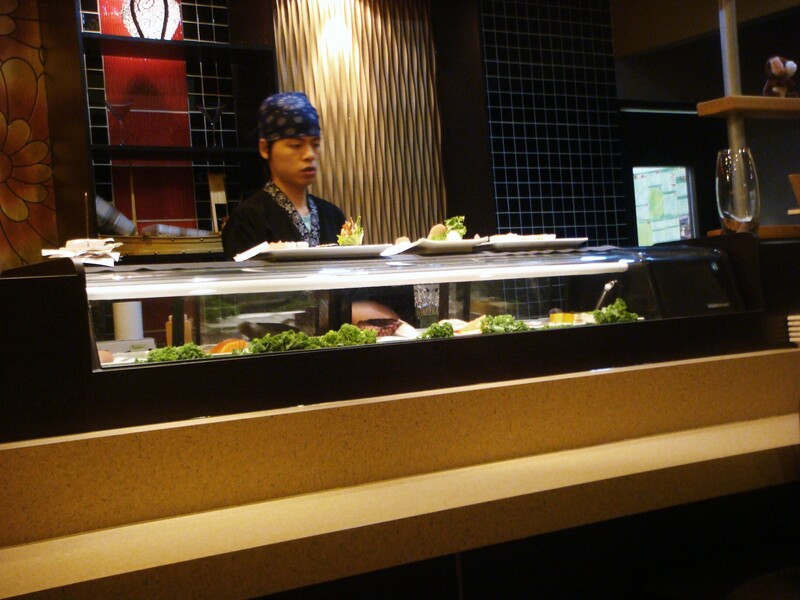 The lady who gave me my meal was very friendly and sweet looking. The whole place had a relaxing aura, very colourful and warm. It definitely doesn’t give off this eat and run vibe to it that some other restaurants can give off. Unfortunately I didn’t take any photos inside since it was a quick visit but the website does show a few. Let’s have a look inside! First thing I noted was that it was quite a lot of food for a lunch time portion. I remember having to finish off the rest another time. The neatloaf was definitely hearty. You could taste all the ingredients that went into the neatloaf, especially the tofu. You could also see the bits of rice. It was definitely delicious and filling. 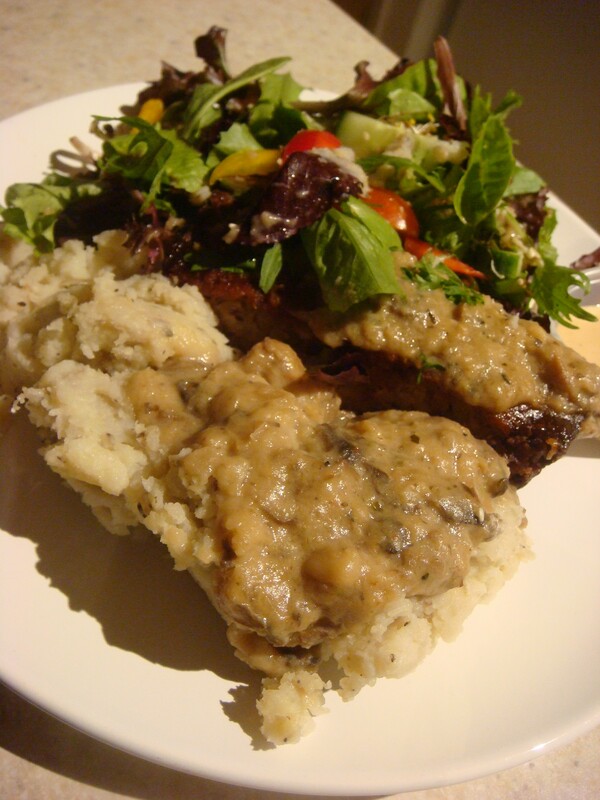 The neatloaf was covered with the gravy so you definitely tasted the mushroom gravy sauce first. My piece of meatloaf seemed to have been a corner so some of the edges were a bit more tough that I would have preferred. The bottom was also a bit more crisp that I really would have liked. The whole thing held well together and had a meaty taste so I definitely didn’t miss any of the flavours. As mentioned it comes with mash potatoes and a salad. The mash potatoes were nicely seasoned. I normally eat the boxed mixed version of mash potatoes for convenience sake so this was a nice change. and the gravy went really well with the potatoes although I would like more gravy to cut the thickness of it. The salad was really tasty. It had a lot of fresh vegetables which included mixed greens, sprouts, cucumbers, cherry tomatoes, bell peppers, red onions; all yummy things! 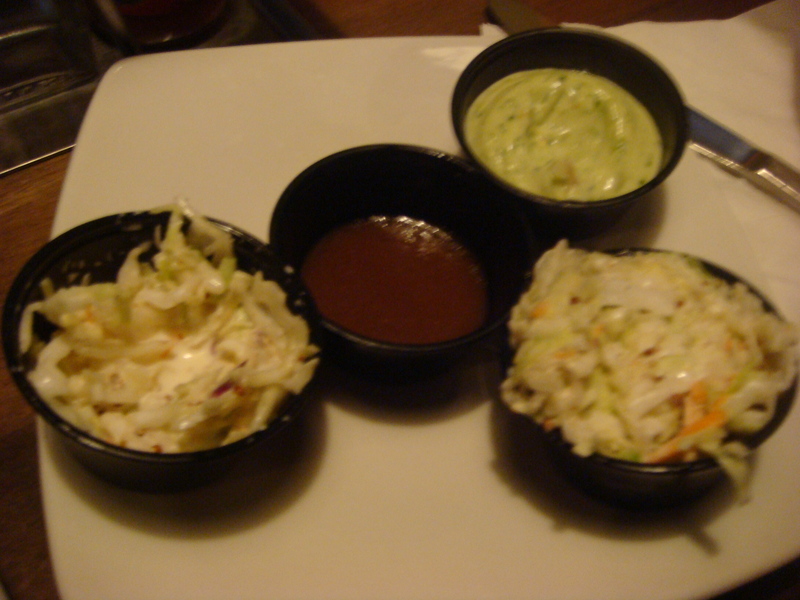 The salad dressing that came with it was unique and had an interesting taste. I was testing it for the longest time trying to figure it out but my palate just isn’t good enough to determine the ingredients. It’s not my favourite dressing but I was willing to eat it, although next time I’ll probably opt for my own dressing. It did go well with the vegetables though. 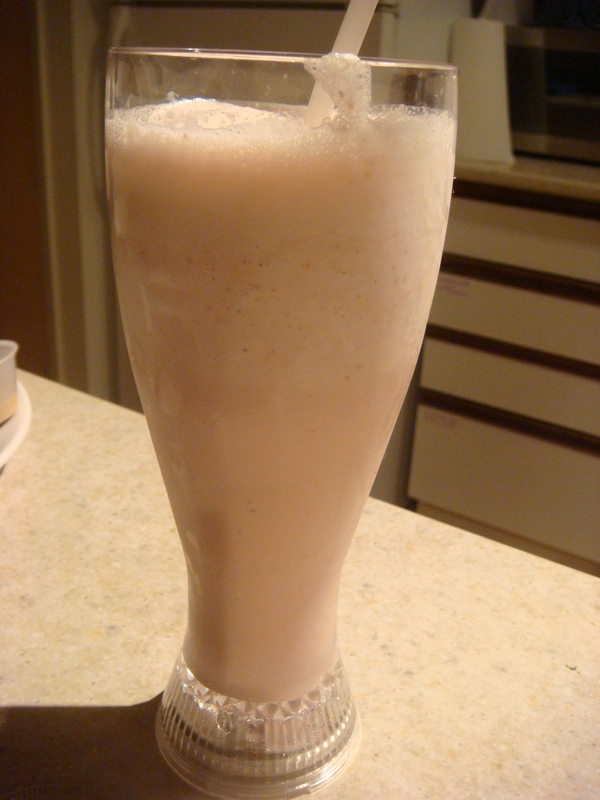 As for the milkshake, it was super light and full of strawberry flavour. They didn’t overdo it with the ice cream so you could definitely drink it through a straw but not so thin that it was a smoothie. There were specks of the strawberries while I was drinking which made me wonder if it was made with actual strawberries. My questions were answered when I found a chunk of a strawberry at the bottom of my cup. 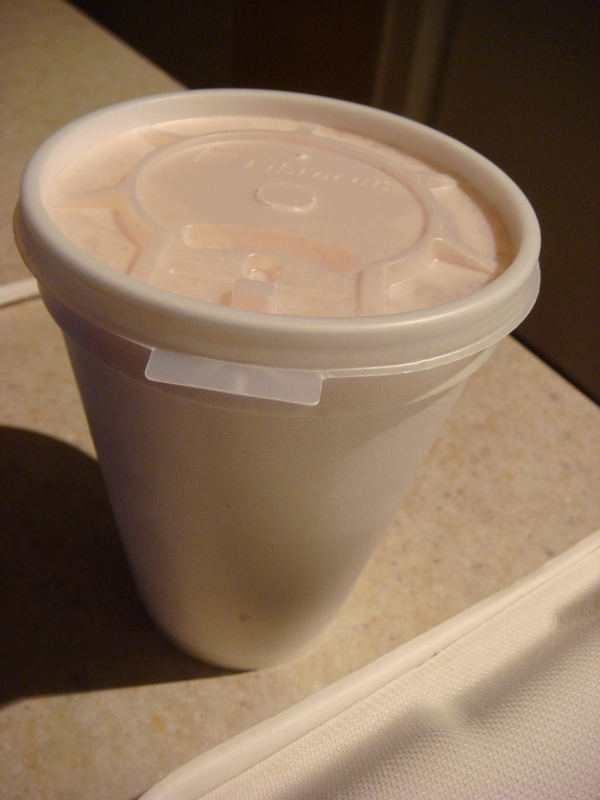 I have a sneaking suspicion that they were frozen strawberries as opposed to completely fresh but for milkshakes, frozen strawberries will do. It was a beautiful pink colour and very well blended. Delish! In total my whole meal was approx $15 with tax included and it was definitely worth it for all that I got. Had it not been the fact that I live so close to the place, I wouldn’t have come across it which would have been a shame. Its definitely an experience, meat fan or not and I highly recommend it. Happy eating! 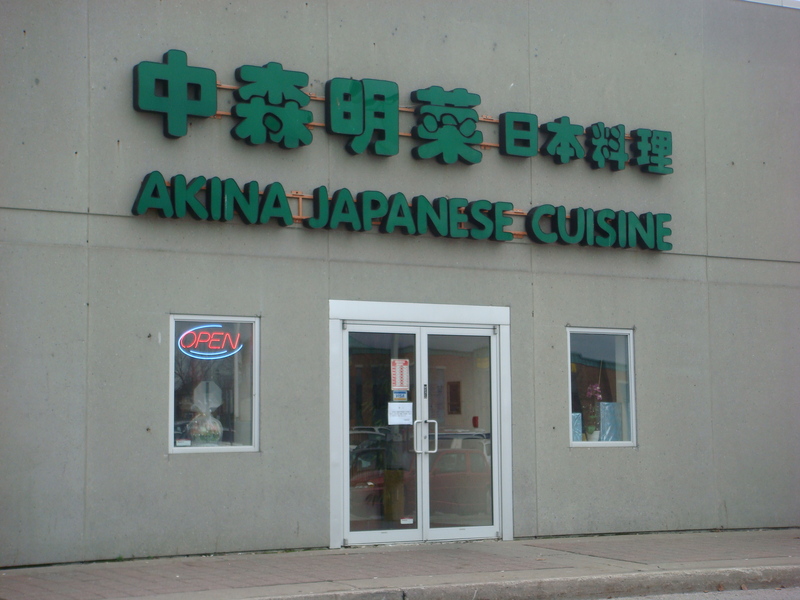 Kingston has a large amount of Japanese restaurants but unfortunately all of their authenticity comes into question as most are under managed by Koreans or Chinese. It’s apparent when you look at their menus and realize that there’s a whole other section dedicated to their cuisine alongside the japanese fare. It begs one to wonder why they don’t just specialize strictly in their food as I would happily go to an authentic Korean BBQ place over a less authentic Japanese restaurant but that’s beside the point. 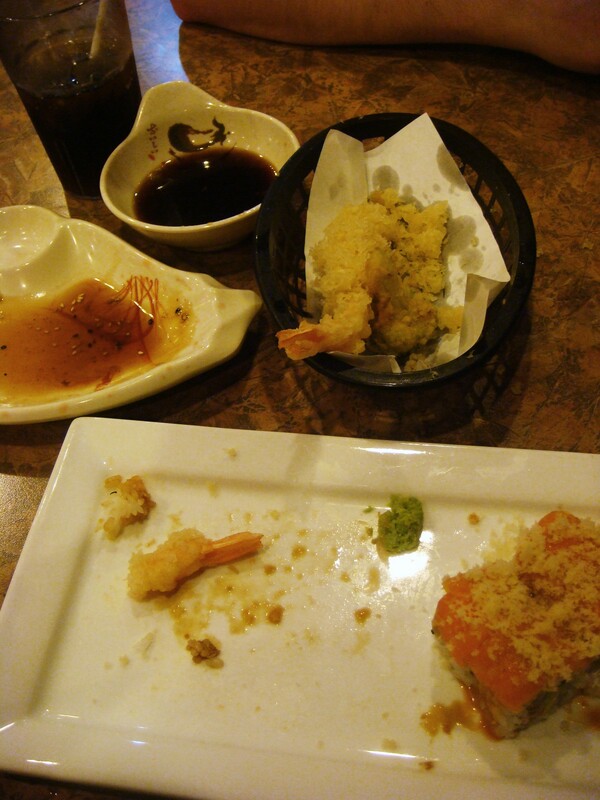 For my 20th birthday, I was having a major cravings for sushi. I had originally considered ordering in as I was still in the process of making my birthday cake and didn’t want to stop but after consulting some of the prices plus the cost of delivery, that idea was quickly squashed. I’ve been a little weary of eating sushi in Kingston due to price and freshness. 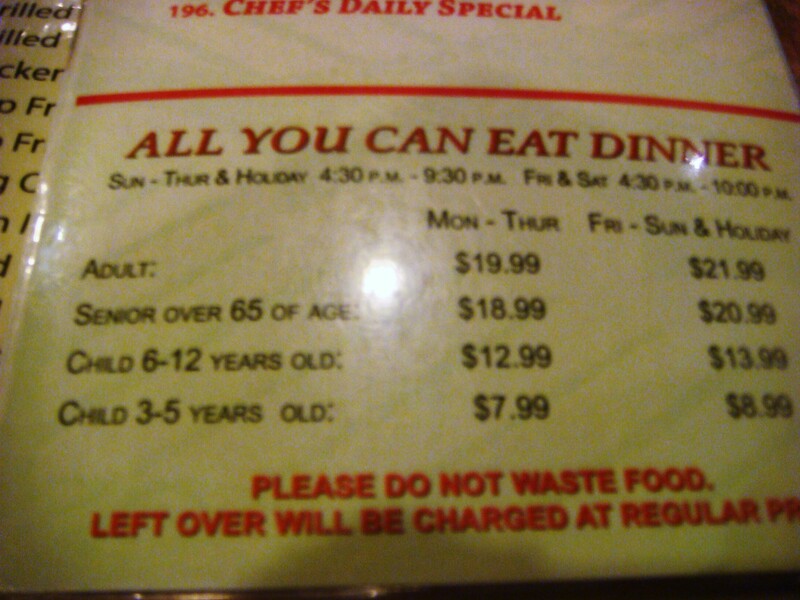 I’m used to the concept of All-You-Can-Eat (AYCE) which is easily found in Toronto for a rather affordable price. I’m also the type of person who often doesn’t eat sushi (to keep it a more special occasion when I do) so when I eat it, I eat TONS of it! 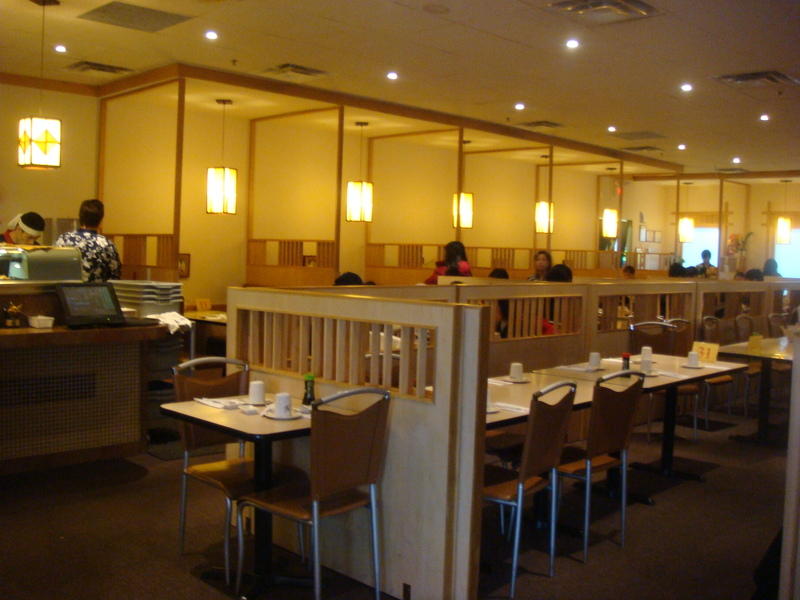 I had heard good things from friends about Sakura, claiming that it was the only place in Kingston to go for sushi. In hindsight now, I realize their advice is a little one-sided since most have not ventured to other sushi places beside Asha and Ta-ke, both of which I’ve read enough mixed reviews. But since it was AYCE, I decided to give it a try. Now A is not a fan of sushi but since it was MY birthday, he was willing to go along. When we arrived I wasn’t sure whether or not to go for the teppanyaki menu or the AYCE sushi menu since I knew that A would probably prefer the teppanyaki more, but I couldn’t ignore my craving and convinced him to just give it a try. The place was rather busy even for a Wednesday night. I realized a little later that another birthday get together was going on. Itwasn’t overly loud and we still were able to enjoy the evening. 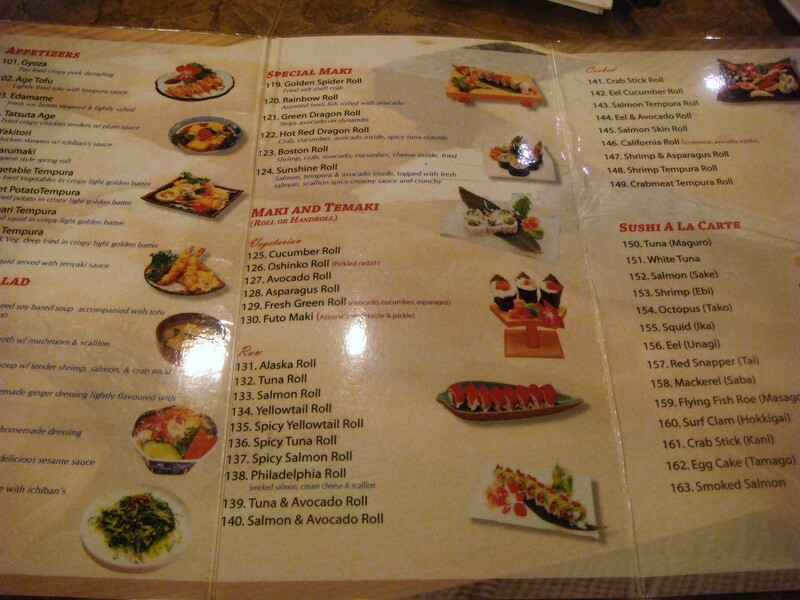 There were two menus provided with the option of AYCE sushi. One listed their menu standards while the other featured some special items. You could definitely tell the Chinese influence on the place as there were quite a number of Chinese dishes. 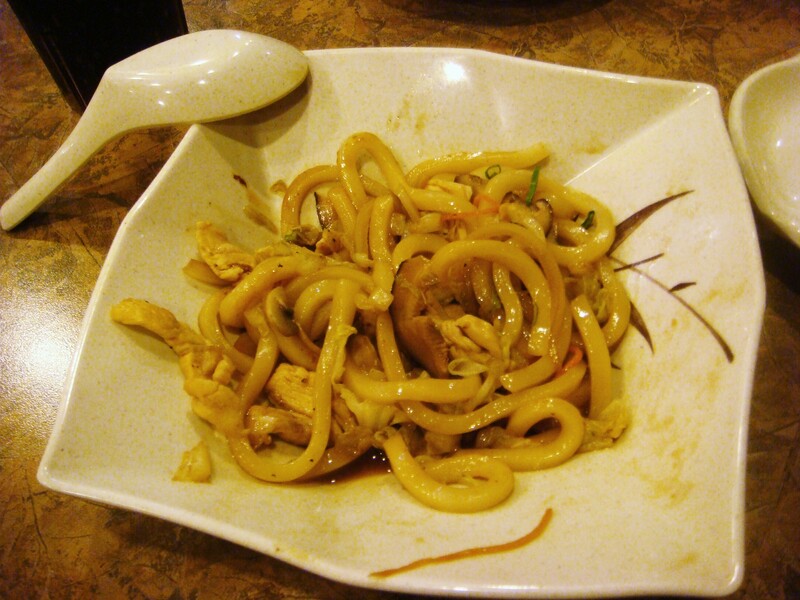 I was really craving udon noodles as I remembered fondly of this delicious soup with udon noodles dish that I always have at one of my favourite Japanese restaurants back in Toronto. Since I wasn’t interested in soup, I opted for the stir-fried variety, chicken yaki-udon. NOTE* I apologize in advance for the yellow tinge lighting on all the photos. This is the flaw in having only a P&S and forgetting to turn flash on. I also apologize for a lack of photos as I was so hungry, I almost forgot to take any at all. The udon itself tasted okay, nothing remarkable. It just needed more flavour. The chicken was horribly dry even amongst the sauce/soup of the yaki-udon. I prefer a little more bite to my vegetables but it would do. The portion was perfect as it allowed you a sample. Any more and I would have over-stuffed myself on the highly starchy noodles. As you can see, I couldn’t manage to get a photo of the steak fast enough before A ate it all up. It was probably the only thing on the menu he was willing to eat. The steak teriyaki was deliciously tender. It wasn’t overly chewy and just melted in your mouth. 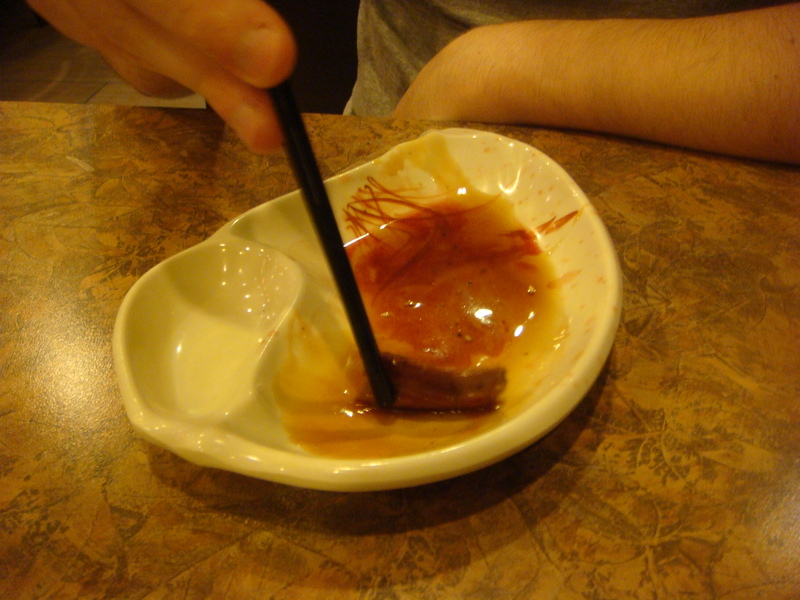 The teriyaki sauce that accompanied it wasn’t overpowering or too sweet as some other Japanese places do it. For example Ta-Ke normally has the meat swimming in its sauce, which I often don’t mind because I’m a huge sauce fan, but of course, the steak should be the highlight. It was a reasonable portion but since it was so delicious we opted to get 3 more servings I believe, most of it going towards A and his appetite. Unfortunately their steaks were inconsistent which dampened our excitement and praise for their steak. One ended up being a little too rare for my liking. I don’t like a steak too well done but it was bleeding a little too much for me to attempt to digest. Another steak was overcooked for its thickness and size so it ended up being horribly chewy with very little flavour, even with the teriyaki sauce. All in all, their steaks didn’t match that of the first experience and we deemed it as a fluke on their part. 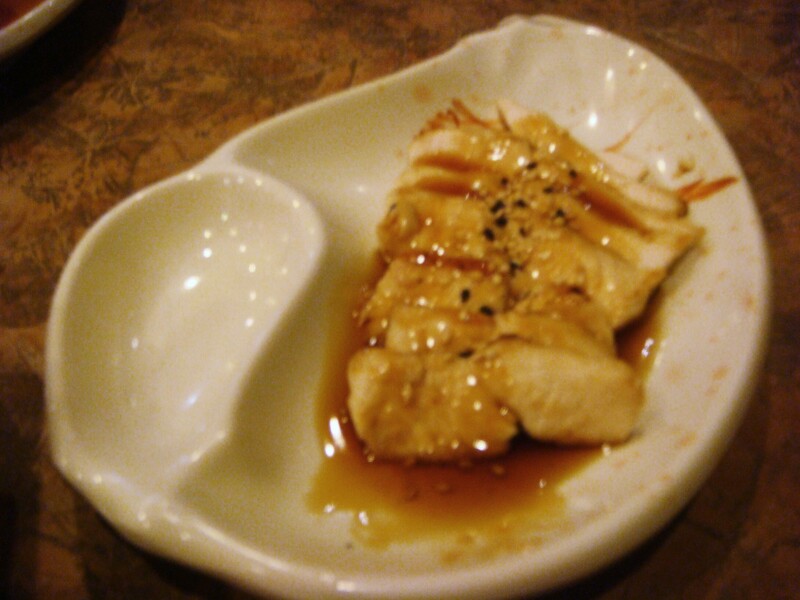 As for the chicken, just like the pieces found in the udon, it too was horribly dry despite the sauce. It lacked flavour and had an unsettling mealy taste to it. It may just have been that night but as a safe bet, I’d avoid it. 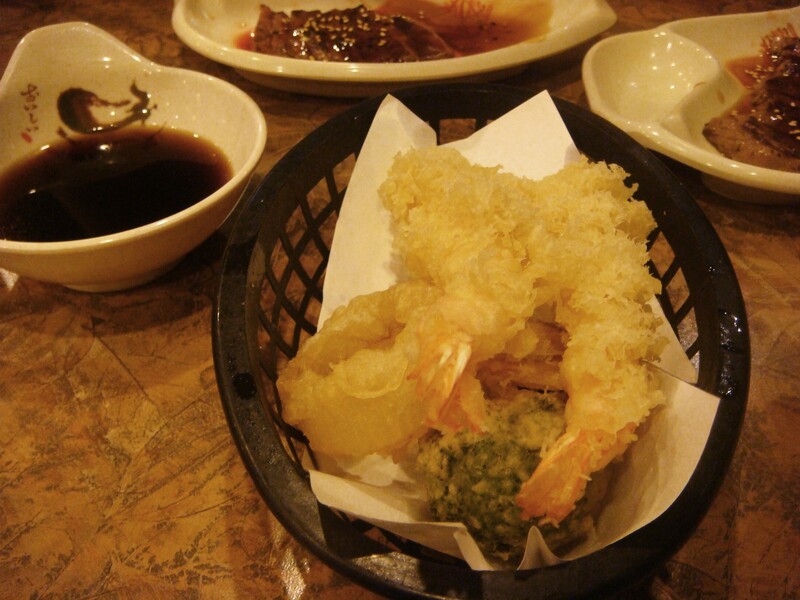 I love tempura and try as I might, I just can’t get it to be like those I find at Japanese restaurants (I’m still working on it) . I don’t normally get the vegetables but it came as a set along with the shrimp. It was fried to perfection, not overly oily. The shrimp were a good size and didn’t have too much coating. I love sweet potato tempura so that out of the vegetables was the best. The onion was a little undercooked but overall a tasty fried dish. 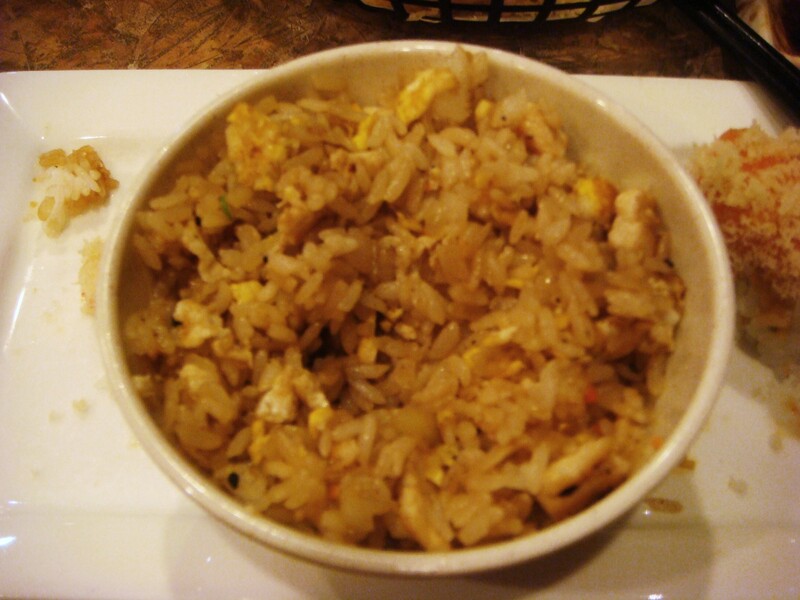 A also ordered some chicken fried rice (I don’t know why we kept ordering the chicken knowing how bad it was, wishful thinking I guess). It was a medium size portion (although much too big for my capabilities at that point). Upon discovering onions A decided not to eat anymore and left that up to me. The chicken was again horribly dry and I picked them out of the rice. The rice didn’t have a lot of flavour but it was passable as a filler. I could certainly fry up a better batch at home. The one and only photo I took of the sushi as it was presented to me ended up being far too blurry to showcase so the best I can provide is the photo above with the few pieces of sushi seen at the bottom right hand side. Knowing that A wasn’t going to partake in the sushi experience I ordered their Sunshine roll (8pcs), as well as a Spicy Tuna roll (6pcs). They describe their Sunshine roll as having ‘Salmon, Tempura & Avocado Inside, Topped with Fresh Salmon, Scallion Spicy Creamy Sauce and Crunchy’. Upon its arrival I was disappointed to realize that the inside salmon was cooked and I’m not particularly a fan of cooked salmon, especially in sushi but I ate it anyway. To be honest, it wasn’t anything remarkable. It was well balanced in textures, underwhelming in flavours and not all that exciting. As for the spicy tuna roll, there was too much rice for my liking and after all the other food I indulged in, I didn’t need more starchiness from rice. It too was nothing spectacular. A and I shared a vanilla ice cream to finish the meal which was sadly probably one of the best things of the night. Overall, it satisfied my craving for the time being but was nothing compared to my experiences back in Toronto. I don’t know if i’ll be returning for their sushi but I may give their teppanyaki a try as I’ve heard mixed reviews on that as well. This time around quantity sufficed the lack in quality. A who didn’t eat much from the menu and was disappointed in the steak at the end probably won’t be joining me for another sushi adventure, however he’s never experienced the cheesy show that teppanyaki offers so maybe we’ll go just to give him something new to look at. As for service, it was certainly lacking. We ended up having to follow up several times for some items and they often took a tad too long to clear the finished dishes. There’s definite improvement to be made there. 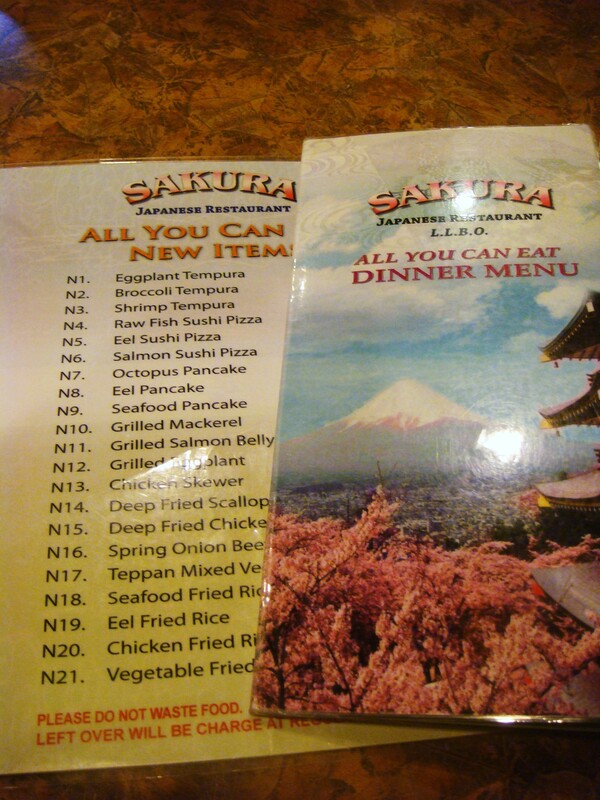 Sakura also features delivery which I will be reviewing next.